Colorful Socks for Colorful Life. These socks are made of 200-needle combed fine cotton material. Breathable and absorbent. Offers soft, gentle and comfortable wearing experience. Colorful and Novelty. Eye-Catching and Fashionable. Ideal choice for funky dressing ideas that is never out of date! Make a little bit difference may totally brighten up your day and light your mood! 30-Day Money Back Guarantee. We accept no-reason return or refund. Totally worry-free! 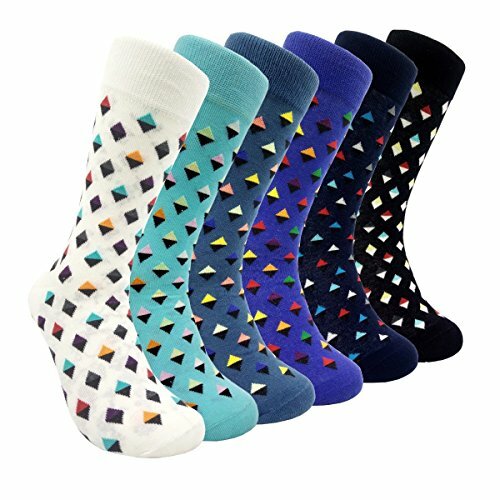 2018 Spring New Design - Fashion Colorful Argyle/Diamond Pattern Design, Brighten Up Your Day and Light Your Mood! Fun Unisex Crew Socks, Perfect for Mens/Womens/Teens Gifts Or Use for Funky Sports, Wedding Socks, Bridegroom/Best man Socks. Be Different and Unique - Whenever You Wear These You Always Get Compliments. Look Cool and Vibrant. People will Enjoy Asking About Your Socks! Perfect for Christmas Gifts. Stretchy and Comfy - Made of 200 Needle Combed Cotton, More Comfortable and Breathable, Anti Smelly Foot. One Size - Suitable for US Sizes 6 to 12. Seal Bag Packaged, Included 6 Pairs Colorful Argyle Dress Socks. BUY WITH CONFIDENCE - 30-Day Money Back Guarantee. 24-Hour Customer Support. USA HSELL SOCKS - SOCKS OF YOUTH , SOCKS OF FUN. If you have any questions about this product by HSELL, contact us by completing and submitting the form below. If you are looking for a specif part number, please include it with your message.